This tulip-magnolia tree is blooming outside the building where my office is located. We continue to have unseasonably warm weather; my garden is scary with emerging lilies of the valley and budding azaleas... these used to appear in mid to late April. Everything seems to be happening a month too soon. I love the weather but it makes me uneasy. For the last three days, temperatures have climbed to the high 70's in Emmitsburg. The pink trees are blooming. Daffodils that usually bloom at least two weeks later than this are in full tilt. You can't tell me that global warming doesn't exist, and isn't happening. I love Spring and welcome its return, but I'm worried. too. 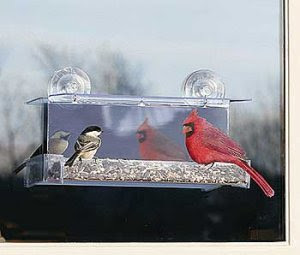 Here is the Duncraft Company's one-way mirrored bird feeder. I have a similar one, though it's not a one-way mirror. Nevertheless, Chickdees and Cardinals like these come to my window, to my great delight. In the US, many people follow NCAA Basketball. This is the season known as “March Madness,” when the 64 top teams play each other in what to me is an incomprehensible selection process. The 64 teams get narrowed to the “Sweet 16,” and eventually, to the “Final Four,” from which a winner emerges. People make wagers about all this. In the Birding world, the Cornell Lab of Ornithology holds an alternate competition - basically, a popularity contest in which birders write in and vote for their 64 most popular species, which gets voted on and narrowed down , and so on. Crocuses are blooming in the garden in the woods. 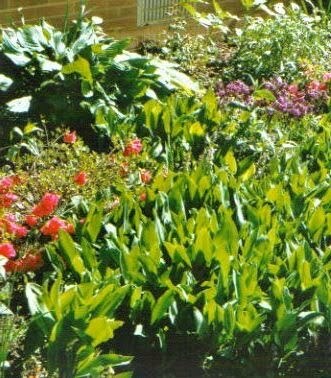 My garden by the house gets southern exposure and the warmth of the brick walls; daffodils and hyacinths are blooming there. 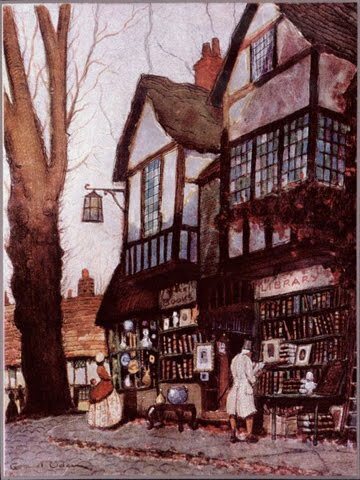 Last night I heard the Spring Peepers - their thousand voices to the full moon. 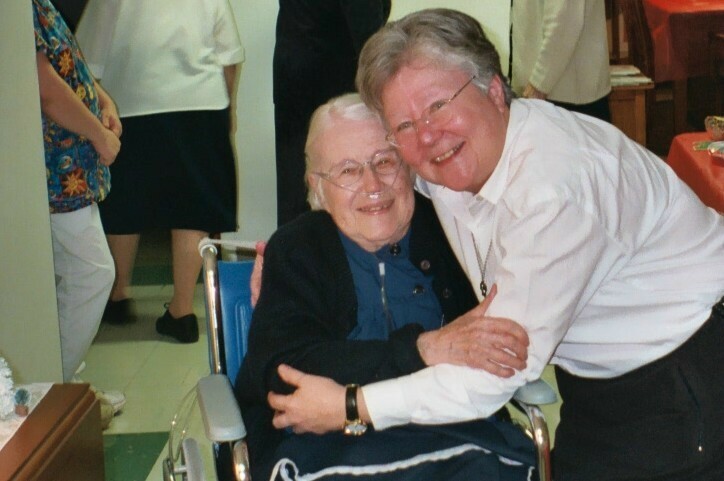 Sister Bertha Robertson died last week in Emmitsburg, about six months short of her hundredth birthday. She had been in our community for 80 years. I knew her first through her niece, Susan, my college classmate and good friend. I met Sister Bertha when I joined the community in 1978. She was a remarkable woman among remarkable women – never a “big name” in the community, always accomplishing invaluable tasks behind the scenes. She was very talented – a musician, a businesswoman, an administrator, but she never held down any titled positions. She came from a remarkable family, too. On her father’s side, she was related to both Francis Scott Key and F. Scott Fitzgerald. Her mother was the first harpist with the Baltimore Symphony Orchestra. She put what could have been a privileged and prestigious life behind her without a second thought when she fell in love with God and the Daughters of Charity at 19. I don’t think she had an ambitious or conniving bone in her body. Back in 1995, one of our sisters, an historian, took an oral history from Sister Bertha, and I am reading it now. It is amazing. 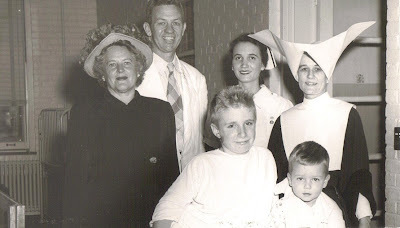 Sister Bertha was one of two sisters in 1964 in the US ( they worked in Central Purchasing) who made the arrangements for our new habits to be made. The design came from the Motherhouse in Paris, and every Daughter of Charity was to change from the old cornette habit ( which the sisters had worn since 1633) into this new one on the same day all over the world in 1964. The arrangements were being made in May and June, and the company making the habits were supposed to be able to make over 800 of them in different sizes by September 20, 1964. It’s quite a story. This will be the first installment about Sister Bertha. I’ll talk more about her in later posts. I might even write some poems about her.